To chase or be chased. Which is a better position in a cyclocross race, hunting down a quarry or glancing over your shoulder and feeling hunted? A target ahead can act as a goal and provide focus. Others, like Danny Summerhill, prefer attacking an open track to avoid getting taking down in a crash by riders ahead and to choose the best lines. On Saturday at Cyclo-X Westminster Chris Baddick (Gear Movement) was Robin Eckmann’s target. Listening to Baddick explain how he became the hunted one, he sounded like a reluctant leader. “I felt like I happened to come to the front by accident. Everyone was slowing down on the pavement and I just ended up at the front of the group,” Baddick said, speaking about the early part of the race. Stay off the front alone consumes a rider’s resources. When it’s blustery – more often than not on the Front Range, it’s easier to sit in with a small group and keep your nose out of the wind. Chasing singlehandedly takes a lot of energy too and not just physically. More tactics come into play, like deciding how long to keep working with other riders and whether to strike out solo. When Baddick attained a gap out front half-way through the race a group of three chased him: Eckmann (California Giant Berry Farms/Specialized) and Evol Foods riders Ken Benesh and Spencer Powlison. Initially Eckmann waited to see if Powlison and Benesh would work together as teammates to bridge up to Baddick. But the gap to the leader widened over three laps. With just over two to go Eckmann chose to go alone after Baddick. He shaved some seconds off the Gear Movement rider’s advantage, inching closer in the bell lap, but didn’t make contact. Eckmann crossed the line second with enough points to maintain his lead in the Cyclo-X series. 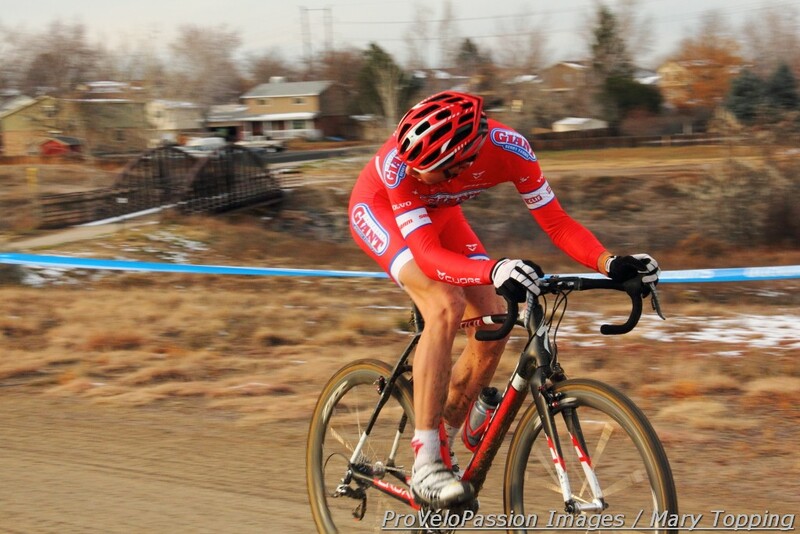 What was it like chasing the “new ‘cross sheriff” Baddick? The initial four of nine laps proceeded at an easy pace for the strongest in the field. Baddick came through with the holeshot. Two minutes later Eckmann sprang ahead of him on the double set of concrete stairs. In the front group of about a dozen riders Benesh and Maxx Chance (Clif Bar Devo) swapped out the lead position with Baddick and Eckmann as the guys seemed to be waiting for something to happen. Evol Foods’ Powlison and Josh Whitney, Chris Case and Pete Webber of Boulder Cycle Sport, Gage Hecht (Specialized Racing Team), Ian McPherson and Garrett Gerchar of Clif Bar Devo, Bryan Alders (Marin Bikes Factory Team), Steven Stefko (First City), and Greg Krause (Groove Subaru/Excel Sports) rounded out the early front group. Structure began to appear when Baddick took off in the fifth lap. Eckmann, Powlison, and Benesh formed a chase group that set off after the Gear Movement man. Chance shadowed them in fourth position with Stefko in fifth. 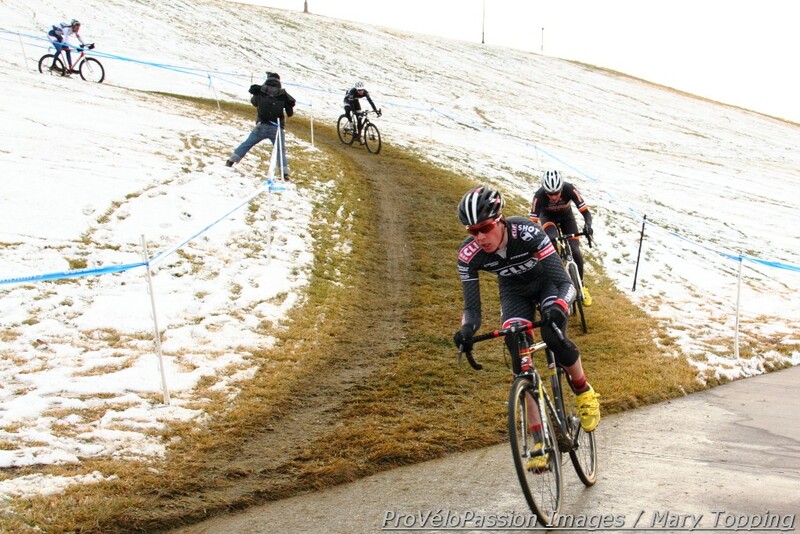 Sometime mid-race Hecht slid out on the long grassy downhill which claimed additional victims and would shake up the podium with one lap to go. Early in the race, Eckmann switched bikes for a rear tire with better grip on the slippery grass. When Eckmann pulled away from the chase group about fifteen minutes remained for him to catch Baddick. The Cal Giant rider collected seconds between himself and the chasing Evol riders and began to dissolve the ones that kept him from reaching the leader. Baddick knew his pursuer was making progress. Benesh and Powlison ran into problems of their own. 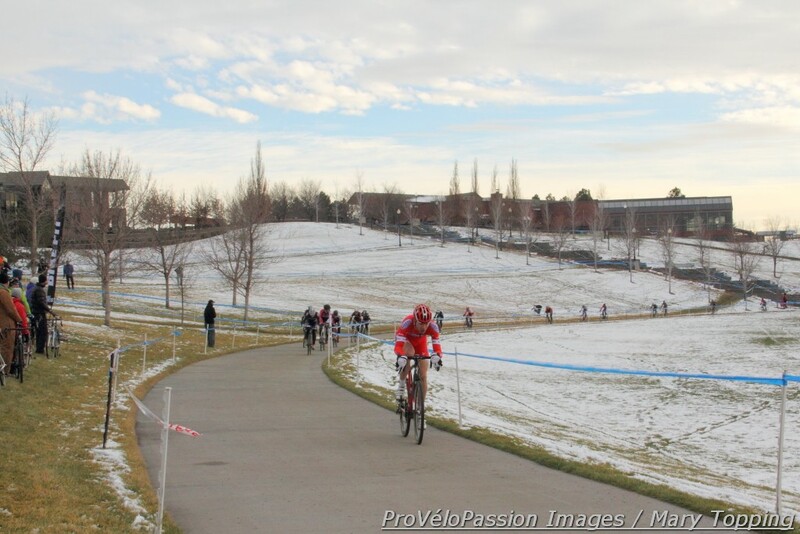 With about one lap to go both fell to the wet grass on the long descent. Chance took advantage and swept by them, taking third place at the finish. Powlison followed six seconds later for fourth. Stefko claimed fifth ahead of Benesh who had been further delayed by a dropped chain after the sliding out on the grass. 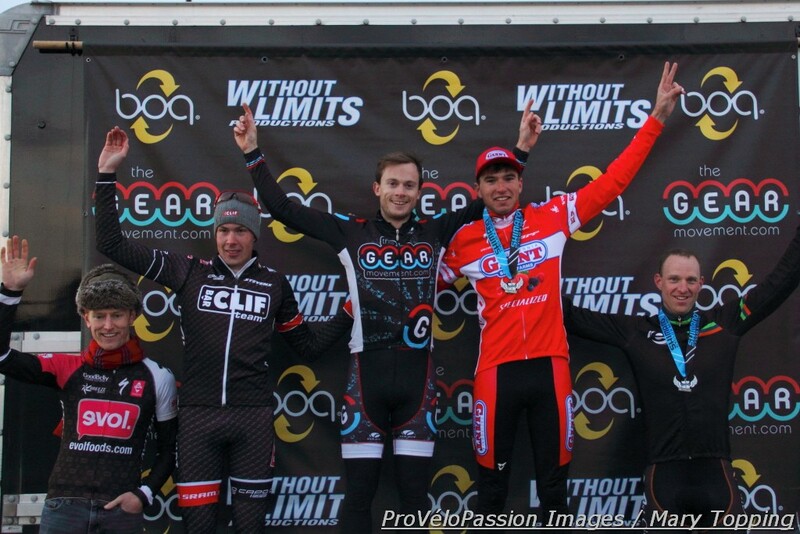 Eckmann continues to lead the eight-race Cyclo-X points series which concludes on December 7 with double points on offer at the Boulder Reservoir venue. 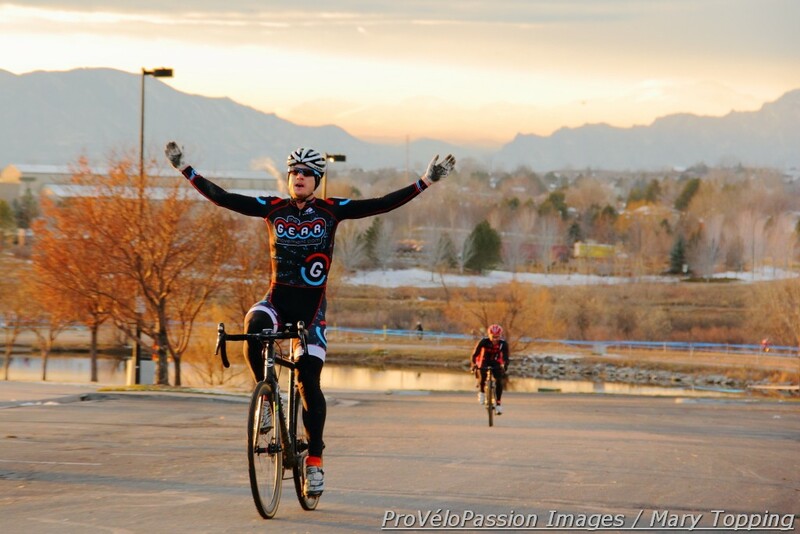 For full results from Cyclo-X Westminster see the Bicycle Racing Association of Colorado’s website.